Everything about training for climbing is complicated. It is an exercise in compromise – focus on power and you lose endurance, too much time getting your fingers strong, and your redpoint grade drops. Over the years, there have been many creative solutions proposed to solve this problem. Many programs are more or less stolen from training plans for other sports, which presents a whole host of issues. The one thing that continues to surface both in the gym and on the rock is that the stronger climbers both avoid injury and send quickly. This is of no surprise: all facets of fitness are derivatives of strength. What is power? Strength times speed. What is endurance? Strength divided by time. The bottom line? The stronger you get, the better everything else gets. So what’s the problem? There’s only one, but it’s a big one: Strength training takes time, both to execute and to recover from. The recovery is the biggest issue. In fact, people who stall out strength training frequently get everything else right – load, volume, frequency – but they under-recover. Why? Because the overload we experience in strength doesn’t “feel” like hard exercise. The sets are short, the cardiovascular component almost nonexistent, and there is never any nausea. In order to get stronger you need to really overload your system. If you really overload your system you need to rest a lot between efforts. If you rest a lot between efforts, you get bored and start the next set too soon. The solution? Find something productive to do between sets. Heavy strength training and finger strength training are almost an ideal marriage. The high total body loads of the strength sets tend not to affect the finger strength sets and vice versa. However, simply alternating between the two can still result in too little rest. In order to address this issue, we add much-needed mobility work between these activities, and the result is an ideal mixture of effective training and an efficient use of time. The Integrated Strength template consists of three exercises done in short “circuit” fashion: a finger strength set, a heavy resistance set, and a mobility exercise. These circuits take about 5 minutes each. We have found that three rounds of this circuit, about 15 minutes, is the ideal training duration. By building three different circuits, you can create an effective and quick training session that clocks in under an hour. Training: Where Are You Going? Too often, we are either in the mode of training for something big or doing nothing at all. We ramp it up for a couple of months, send the route, and then hang back and take stock of our achievements. Even worse, sometimes we opt for long-term difficult training programs that look fabulous on paper, but we never seem to execute. But what if there was a better way? What if your underlying goal in training was to develop a readiness for the sport that you could carry with you at all times. Whether we like it or not, we can only be driving hard part of the time. As the old maxim goes, “If you are always training hard, you’re never training hard.” What a program like the one suggested here can deliver is a solid foundation on which to build specific fitness. A two-day per week base of Integrated Strength sessions will marry well with a bouldering phase, a high-volume alpine training phase, or even a peak redpoint phase, all the while allowing you to continually push the juggernaut of strength forward. There may even be long periods of the year where you do next to nothing on the rock or in the mountains. This minimalist program will keep you fit enough to get back to shape quickly when the opportunity arises. Strength coach Dan John talks about “park bench” and “bus bench” workouts. You’re on the bus bench when you are going somewhere, on the park bench when you’re not. Integrated Strength makes an excellent holding-pattern session – a park bench workout – when you are not quite ready to lock horns with a project. When it becomes bus bench time, you simply increase your training loads, reduce the hold size on your hangboard sets, and get going. By now, most climbers understand that stronger fingers are a benefit in climbing. Simply climbing to gain this strength, though, can result in uneven loading, can allow you to avoid certain difficult hold types, and isn’t regular enough an overload to elicit optimum improvement. The tool of the trade is the hangboard. The training for optimum finger strength includes repeated sets of isometric hangs. We get into trouble when we go too hard or too long on these boards; the very thing that makes you strong so quickly can also injure you. 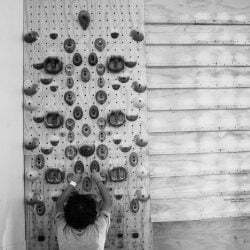 There are several terrible hangboard training programs out there, and there are some very good ones. Even the good ones can lead to trouble, mostly as a result of trying to hurry through the sessions or progress too quickly. A good starting point is to perform 3 sets of 10 seconds in three different hand positions. This workout is so simple and safe that you should stick with it for as long as possible – at the very least ride it out until you no longer see any improvement from it. We will use this set and rep plan in some of the examples below. When training finger strength, specificity is an important consideration. You want to train both the hold types you use most frequently and the ones that give you the most trouble. A look at any popular hangboard, and you can see that the variety in possible hold combinations is almost endless. Don’t get sucked in. There is nothing so special about a particular protocol that makes it “the best”; in fact, the best program is probably to change programs every couple of months! Pick three positions, and train them exclusively through a 4 to 6 week phase. Keep your goal in mind: do you want to be trained or entertained? The stronger you are, the easier everything else in sport becomes. Although for years I insisted that climbing was different from other sports, the fact is that all sports are different from other sports. The common link? The human being. Climbers must generate force the same as everyone else. Yes, we do so by balancing strength with focus, route reading, and fear management, but the mastery of tension forms the base of all we do. We have to do very sport-specific training, just like every other athlete. But at the core of training, we still find the fundamental human movements. Like it or not, the best way to develop those movements is in non-specific environments. We simply can’t generate enough force in climbing specific positions to progress to our full athletic potential. Although the movements can be divided up a few different ways and can feature subsets, most coaches agree that training the four basic movement patterns give the biggest bang for the buck. Those movements include the Upper Body Press, the Upper Body Pull, the Hip Hinge, and the Squat. These patterns are the most useful because they force you to use several muscles at once to produce force. This is both efficient and effective at producing high levels of hormonal activity – which is half the reason we do them. In this program, we focus on three of the four movements. Our movements include the Hip Hinge, Upper Body Press, and Squat. Why no pulling? Well, because you are probably overloading the pattern already. More importantly, though, the Hip Hinge is going to be a big pull, and the finger strength sets also represent a pull…enough! This training plan integrates well with bouldering or route climbing, where you’ll be pulling all day long anyway. Remember, the goal of most training is not to improve the things at which you are already elite – it’s to shore up the things that are holding you back. Full details for these exercises are available below. It is critical to perform the exercises correctly: if you don’t know them, don’t do them. Find a good strength coach and invest some time and money in learning correct form and loading. Mobility is simply the ability to use a joint through its intended range of motion. For the most part, our knees and elbows aren’t a problem. The shoulders and hips, especially in adults, are an issue. As a general rule, if you can’t hold both arms straight above the head without arching your back, your shoulders are too tight. One of the effects of building massive strength and power in the back and shoulders without maintaining mobility is to get tight – so tight that you are effectively shorter when you reach high above your head. Immobility in the hips is also a problem. If you can’t do a full squat with your heels on the ground, or can’t get your hips within about 3-4 inches of the ground in a frog stretch, you are probably not going to maximize your body-positioning ability. The difficulty with mobility work is that it is boring and it’s hard to tell if you’re getting better. There are two relatively easy tests you can do that will give you a good indication how you are progressing. The first is the hip test I alluded to above. Assume the frog stretch position, with the feet placed against a wall. Your shins should be perpendicular to the wall (right angle at the ankle), and your thighs should be parallel to the wall (right angle at the knee). Bearing most of your weight on the elbows, lean “forward” onto the arms and move the knees as far apart as possible. Realign the legs to get your right angles again if necessary. Once you have relaxed into the stretch, look at how far your hips are from the ground. A good measure is to take a fist and place it on the ground below your pubis – the bottom part of your hip bone that sits right above where you go potty. If your hips touch the fist, your mobility is probably pretty good. More than two fists away from the ground, and you’ve got some work to do. Measure the length of your hand from the tip of your middle finger to the distal crease at the junction of your palm and forearm. This is the wrinkle closest to your palm. Next, make two fists, with the thumbs tucked inside. Reach over your head and back with your left hand, and behind your back with the right. Try to get the fists as close as possible together along the spine. Have a partner measure the distance between the fists. Repeat the same test on the opposite side, right hand over the top. Compare these numbers to your hand-length measurement. If either side is greater than your hand measure, you might have a shoulder mobility issue that should be addressed. Training sessions should be simple and logical to follow. I prefer to under-program the training and let my athletes add-on more at the end than to over-program and risk them not finishing the workout. In the integrated strength sessions, we program three hangboard exercises, three strength exercises, and three mobility drills. These are grouped into small circuits that are each performed three times. For example, in one circuit, you’d do an edge hang, a set of squats, and a prying cobra. This group would be done three times before moving on to the next group. The pacing of this session is its beauty, you move slowly and deliberately between the three exercises, and the movements and load are different enough that each exercise serves as an effective “rest” from the other two. For most climbers, each circuit takes about five minutes, and thus each group takes about fifteen. Including a good warm-up, the session takes about an hour. That being said, there is no reason to hurry through this…going heavy is more important than going fast. There is little reason to add more groups, rounds, or sets. The volume is high enough to make you stronger but low enough to keep from tapping you out for the week. If you need a little more work, consider adding some easy bouldering or route laps at the end of the session. If you are in the weight room (and can’t climb right after the session), consider adding a barbell or kettlebell complex. This is a standard, easy-to-implement program that can be done in most good gyms. 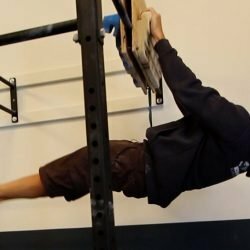 This workout implements the Chris Webb-Parsons hangboard protocol with resistance and mobility training. This is a good program for an intermediate to advanced trainee. This workout is appropriate for those who do not have a weight room close to their hangboard. 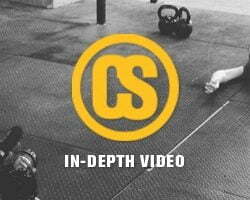 This session incorporates 3-3-3 second hangs with bodyweight resistance exercise. The 3-3-3 hangs are done on a 5 second clock: hang 3 seconds, let go for 2, hang for 3, let go for 2, hang for 3, then move on to the next exercise. We do these sessions 2-3 days per week during a strength phase. In-season, climbers will use this as a strength-maintenance session every week or 10 days. This also works as an effective test: although you don’t want to increase your loads in-season, you also don’t want to regress. If you start to get weaker, it’s probably time to up your high-load training again or train strength more frequently. The bottom line with programming is you want to train as little as possible to achieve the desired results. If you are getting stronger on three days a week, try backing off a bit and see if the gains still come. The mistake we make, that we all make, is thinking that we can somehow increase the slow process of adaptation by adding more training. Strength comes slowly. The deadlift is pure strength. There is no cheating the range of motion – you pull from the ground and you don’t dare stop until you are standing. Although it works the legs, it is primarily a “posterior chain” exercise, taxing the hamstrings, glutes, and muscles of the low back. For building pure total body strength, no exercise comes close. The stance should be shoulder width apart or slightly narrower with your toes slightly kicked outward or neutral. The hips should be above your knees and your shoulders above your hips. The shins should be vertical and the barbell should be touching your shins. The grip is outside your stance, somewhere around shoulder width apart. The head, neck, and spine are neutral. Before you lift, take the “slack” out of the bar. This means tense your whole body like you’re going to lift the bar, but don’t. Have a proud chest, squeeze the barbell, flex your lats, and fire your glutes. As you pull the barbell up your shins, the hips and shoulders rise simultaneously while keeping a neutral spine. At the top, completely lock out the deadlift my squeezing your glutes and your quads. Reverse the movement and once the barbell gets past your knees you can drop it to the floor. We use this exercise with almost all of our athletes, almost all the time. The kettlebell swing is a great exercise for lower body power development and integration of movement. Start with the ‘bell on the ground a foot or more in front of you, then reach down and “hike” the bell back to start the reps. When swinging, only squat enough to get the bell between the legs (handle passing above the knees) and snap the hips forward to raise the kettlebell to the height of the sternum. Swinging higher in the so-called “American swing” actually diminishes the power component of the exercise, making it an easy knee-dominant movement instead of a hip dominant move. Many coaches caution against swinging overhead due to the dynamic lumbar flexion that most athletes exhibit at the top of the move. The single-leg hip thrust is a bodyweight hip hinge exercise that we do when we don’t have tools available. I feel that it is inferior to deadlifting and swinging, but we do what we have to do when we don’t have weights around. To perform this exercise, lie on your back. Bend one knee to 90 degrees and plant that foot on the floor, the other leg should be held up off the ground. The movement involves driving the heel of the planted foot into the ground, and lifting the hips until the spine is aligned with the femur of the working leg, “straightening” the hip. The entire movement should be done under full control. Do all of the prescribed reps on one side before moving to the other. The single-leg squat is the top of the food chain in leg training for athletes. It requires high levels of strength, but also a tremendous amount of balance and mobility. It is a motorically difficult movement, and is often enough of a challenge at first to discourage athletes from continuing to practice. Over time, this should become a staple in your training. Start by standing on a box or bench at least 16” high. Turn so that one leg is held in the air to the side of the box, and the inside of the planted foot is right at the edge of the box. Although this exercise can be done at bodyweight, it is actually easier to start with a little weight in the hands to help with balance at the bottom of the movement. A pair of 5# weights is probably about right for most athletes to start with. Sit back, and as your hips drop, raise the weights up to shoulder-height out in front of you. Squat down until the top of your thigh is parallel to the floor. Concentrate on keeping the heel planted and drive the movement from there. Progress this exercise by adding a little weight to the dumbbells. Once your bells are over about 15 pounds, this becomes problematic. If you get this strong, the exercise should be progressed to a pistol squat or you should add weight with a vest. Most adults don’t have the mobility to squat correctly without some amount of training. In order to train strength effectively until that mobility comes, we often put our athletes in a split-stance position. From split squats, to lunges, to step-ups, training one leg at a time is both effective in building strength and very specific to sports movement. The rear foot elevated split squat is a very good strength and balance exercise that is easy to master. It is usually the precursor to single leg squatting, but is a staple of great programs on its own. Start by grabbing a pair of kettlebells or dumbbells (kettlebells are preferred because they are easier to put on the ground if you fail). Stand tall and assume a split position like you would in a lunge, except that the rear foot is placed on a 16-18” box or bench with the top of the foot down. With an upright spine, squat down until the front thigh is parallel to the floor, then return to the top position. Start with the weaker leg forward, and always match reps with the stronger leg forward. The rack squat is a front squat done with kettlebells. As simple as this variation may seem, changing to kettlebells represents a substantial improvement in the movement for most athletes. Positioning the kettlebells in “the rack” forces a solid core and allows you to move quickly between exercises: cleaning the kettlebells and starting to squat is much faster and easier than setting up a squat bar. Start with a pair of kettlebells placed side by side on the ground in front of you. Grab the handles and clean the bells to your shoulders (if you don’t know the clean, now is the time to learn). In rack, you should be standing tall, bells sitting in the crooks of your elbows, with the elbows held tight against the ribs. Forearms should be vertical, and wrists straight. The movement involves sitting “between the heels” and maintaining that good, upright position. This is an easier variant of the squat than most, and you should find full range of motion is easier than in the barbell variants. Look for a clean, smooth movement – if you have hitches in any part of the range of motion, back off a little on the weight. At the end of the set, reverse the clean (rather than dropping the bells in some weird side to side curl movement) and set the bells down. A more advanced movement, the kettlebell press involves significant core stability. I prefer the kettlebell for the overhead lift over dumbbells; the offset center of gravity helps open the shoulder and ensure full overhead extension. We start this movement in rack position and rotate to a palm-forward position at the top. This can be done with one or two kettlebells, though the 1-arm version is simpler. People generally freak out when we tell them to do one-arm push-ups. This is a feat of great strength, and we all know it. There is a way to progress into the movement by inclining the upper body, and we’ve had great success in getting athletes to a full version on the ground with careful progression. Start with your non-dominant hand on a countertop or box (we like an Olympic bar placed in a rack at waist height). Assume a solid foot stance, with feet slightly wider than shoulder width. Brace the abs actively as if readying for a punch in the stomach. Lower yourself into a full-range push-up, being sure to get the working hand within an inch or two of the chest. Press up under full control, then repeat the movement on the dominant side. As you master the prescribed reps at a given height, reduce the height of the implement by 2-3 inches, then work up to your max reps again. A self-limiting exercise, the one arm kettlebell bench press forces the athlete to do two critical form corrections: the elbow is encouraged to stay alongside the torso and the athlete must brace from the core in order to stay on the bench. Most athletes have done the bench press. This is the same movement pattern, but the set-up is a little different. It is best to start in a standing position with your back to the end of the bench. Clean a single kettlebell to rack position, then squat to the bench and sit. With the non-working arm, brace the kettlebell as you lie back into position. The kettlebell should remain in rack position, even though the elbow will naturally drop back (down) as you take your position on the bench. Once you are in place, set a wide foot stance, then press the bell through a full range of motion. Upon completion of the set, reverse the set-up: brace the bell with the non-working hand, sit up to a squat position, then stand up. Reverse the clean and carefully put the bell on the ground. We have three “big bang” hip mobility drills that make up the bulk of our hip mobility training. There are dozens of good exercises, however, and if you find a different exercise works best for you, have at it. The frog drill is a hip-opener that will help not only with improving your squat form, but with your turn-out on the rock. The frog is performed prone, with the knees turned out to the sides, and placed on a mat. Most knees can’t handle this exercise on a hard floor. Turn the feet out to the sides, and place the elbows on the ground directly below the shoulders, most of your weight should be on your arms. Rock the hips back toward the heels, then move them slowly up toward the elbows. Once at the top position, try to move the knees out to the sides slightly, then repeat the motion. Maintain the movement slowly for 45-60 seconds, trying each time to relax into the bottom position. The tug of war squat can be seen as a standing frog stretch. Holding onto a solid object, such as the upright on a power rack or a door frame, squat down to below parallel. Once in the bottom position, drive the heels into the floor, hold the torso upright, and gently rock back and forth to relax into the hip stretch. Use this to practice the perfect bottom position in the squat. The prying cobra is a great hip flexor stretch. Assume a prone position, with the hands placed palms down to the sides of the chest at the level of the bottom of the ribcage. Legs will be held straight, with the tops of the feet on the floor. Tighten the abs, and press up until the arms are straight. By keeping tight in the abs, you’ll eliminate excessive lumbar extension and force the stretch into the hip flexors. To increase the sensation, you can gently rock to the right and left to focus the stretch a bit more. Often, a climber’s greatest opportunity for advancement is an improvement in the function of the shoulder. Whether it is strength, stability, or mobility, we rarely see a climber that doesn’t need some work. Just like the hip drills, we stick to three main exercises. The Arm Bar is a big-bang shoulder mobility and stability exercise. This is an excellent drill for developing thoracic mobility and shoulder girdle stability. Pick up a light kettlebell and set-up as you would for the get up ( kettlebell at full extension in the right hand, right knee bent and foot placed on the floor). Stretch the left arm overhead, and using the left arm and leg as an axis, bring your right knee up to the chest and roll to the left. Roll over to bring your chest toward the ground, resting the head on the left biceps or on the ground. Straighten the right leg, and try to push the right hip toward the ground. Creep the left hand “back” along the floor, and keep both shoulders pulled down and away from the ears. Hold or pulse the position for 30-60 seconds. To roll the rhomboids (between your shoulder blades), place a foam roller on the ground and lie perpendicularly across it, resting the foam roller just below the shoulder blades. Pick the hips up off the ground, support the head with the hands, and slowly move yourself across the roller, back and forth along the length of the shoulder blade. The rolling range is about 6 inches, too high and you stress the neck, too low and you’ll stress the lower back. As an alternative, you can simply hold a good stretch in various positions to help open up the front of the shoulder. Moving to the lats, lie across the foam roller with the roller resting just below the armpit. Pick the hips up off the ground, then position yourself so the lat is being pressed by the roller. Move slowly back and forth across the roller, being careful where you cross the outer edge of the scapula; this position can be very painful. Spend plenty of time on each side. Holding a PVC pipe or dowel overhead, lock the elbows and lower into a full-depth squat. As your torso leans forward into the movement, the overhead position will naturally stretch the pecs and lats. Try to keep the arms aimed straight at the ceiling, and move the hands as far apart as needed to keep the elbows straight.